Bootees, electrically heated, type H. Stores reference 22c/1016 & 1019. Size medium. Blue gaberdine outer to which is sewn a high wattage (24 volt) heating element and stockinette fleece lining. The ends of the element terminates above the ankle and are riveted to press studs that can be connected to a wired Sidcot flying suit or other wired garments including the postwar Fleet Air Arm version of the Taylorsuit. This is an unused/unissued matched 'pair' with their original waxed paper packets. Very light storage marks but no wear or moth damage whatsoever. Labelled with war department broad arrow markings, reference numbers etc. 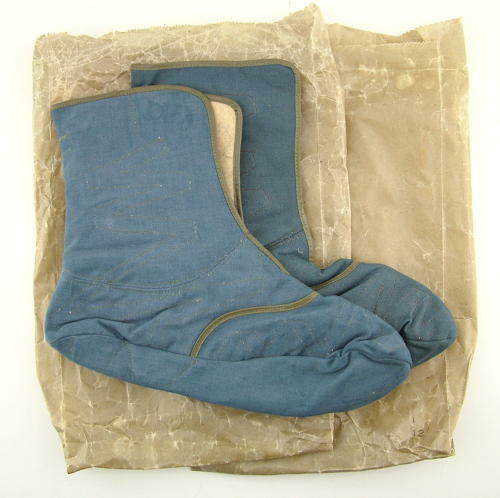 Matched contract numbers too which is very unusual as like flying gloves, left and right bootees were produced and packaged separately. In superb condition. Stock code B22614.